This online WHMIS e-Learning training program presents an interactive design for education and training under Workplace Hazardous Materials Information System (WHMIS). The goal of this online training program is to give participants knowledge and information which they can understand and apply to safely handle, store and dispose of hazardous materials. 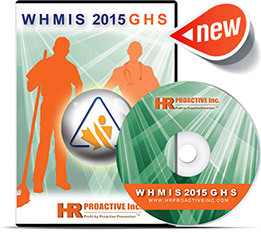 Our online WHMIS 2015 GHS e-Learning Program can be purchased as a SCORM 1.2 compliant package or hosted on our Learning Management System (LMS) or yours. Average time to complete this online WHMIS e-Learning training program is approximately 45 minutes. This online WHMIS e-Learning training program is self-paced. Participants may pause/leave the online training program at any time and can resume where they left off.